Our studios are centres of excellence, staffed by highly trained teachers, all of whom have trained in a traditional apprenticeship environment and have a minimum of 5 years teaching experience. 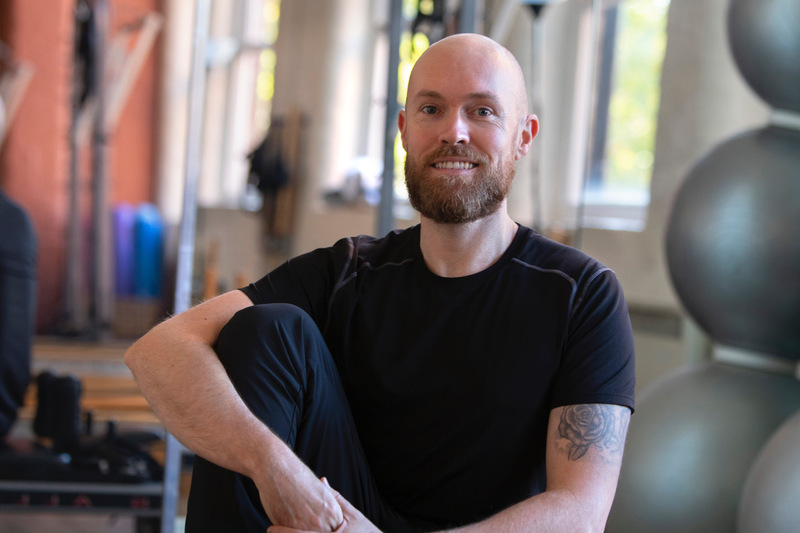 Andy Adamson is a former freelance choreographer and dance researcher and now Director of two highly successful Pilates Studios in Birmingham, Cool Pilates JQ based in the city centre Jewellery Quarter and Cool Pilates BG set in the leafy suburb of Barnt Green. 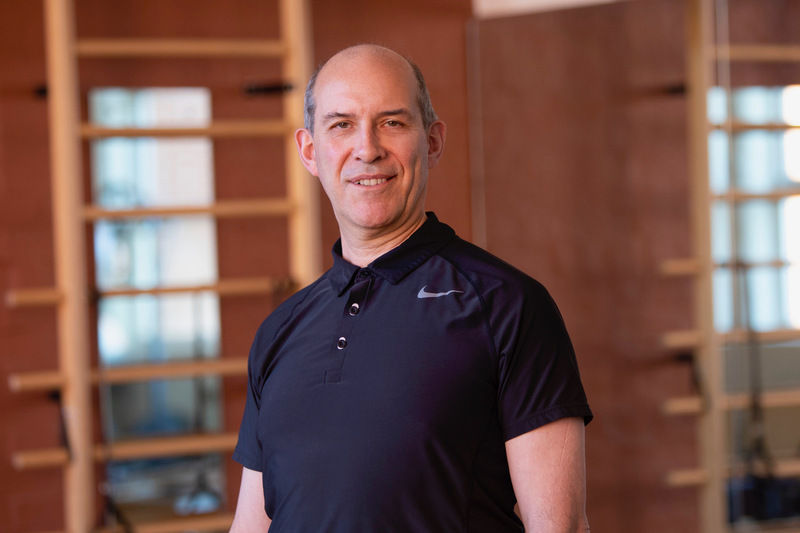 He has been External Examiner to the University of East London BSc in Complementary Medicine (Pilates) and Internal Verifier for Pilates Studies at Elmhurst School of Dance. He was formerly Director of Dance at the University of Birmingham where, for over 20 years, he created original works of dance and theatre with student and young professional dancers. After retiring from the University he become Artistic Director of Red Pepper Dance Company and set up Bodyline Pilates Studio later to become Cool Pilates. He has worked with many systems of mind-body training including Alexander Technique, Tai Chi and Bartenieff Fundamentals. His interest in Pilates work developed in the 1980s as an integral part of his training in American Modern Dance. However, his first serious foray into Pilates work came after a knee operation when he decided to train in Pilates Matwork with Juliet Wynne (1994). 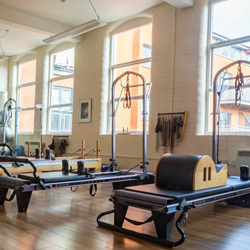 In 2002 Andy undertook the Foundation Training Programme for Teachers of Pilates (fulltime, one year), at the Oxford School of Pilates (with Jane Paterson) and with one of the world’s foremost experts in Pilates Alan Herdman at his studio in London. 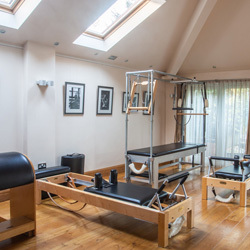 Andy has continued his professional development working with Tony Kosoto studying Rehabilitation in the Pilates Environment, the Pilates Matrix (diagnostic tools for Pilates teachers) and Classical Pilates with Jay Grimes, Mejo Wiggin, Alisa Wyatt, Peter Fiasca, Kathi Ross-Nash, Michael Miller and Clare Dunphy-Hermani. His Corealign training was with Portia Page and Veronique Coignac. In 2015 Andy completed a mentorship with Mejo Wiggin in The Classical Syllabus. Andy is well known for his skills in rehabilation and has built up excellent working relationships with many healthcare professionals in the West Midlands. When he’s not teaching Pilates Andy uses the Studio to practise his other passions, dancing Argentine Tango or rehearsing with his trad jazz ensemble Syncopated Rhythm (trumpet, trombone). Prior to qualifying as a Pilates Instructor, Rachel enjoyed a rewarding 18-year career dancing with the Atlanta Ballet in the USA (1987-1992) and later as a Principal Dancer with the Birmingham Royal Ballet (1992-2005). Throughout her career Rachel incorporated Pilates into her daily routine under the guidance of Jennifer Bintley. It was while training in Birmingham Royal Ballet’s renowned Jerwood Centre, developed by leading Sports and Dance Consultant Physiotherapist, Sharon Morrison, that Rachel became inspired to pursue a career as a Pilates instructor. Following her retirement from dance in 2005, Rachel moved to London to re-train with leading expert Alan Herdman. After qualifying as an instructor, she taught Pilates for a year in the United States. 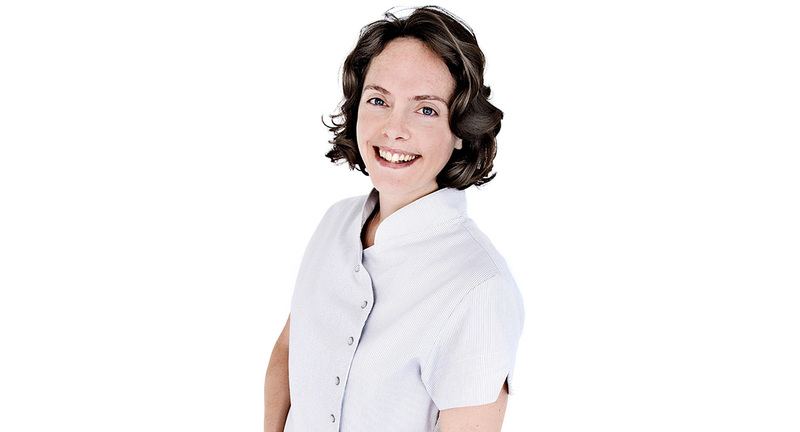 In 2008 she returned to the UK and has been teaching at Cool Pilates in Birmingham’s Jewellery Quarter ever since. Rachel continues to develop her skills as a Pilates instructor by attending various conferences and lectures, including Mariska Breland’s “Pilates for MS and other Neurological Conditions”. This has led her to become passionate about working with clients who suffer from the effects of Stroke, live with Parkinson’s disease, Multiple Sclerosis (she is a volunteer at the MS Society in Birmingham) and Muscular Dystrophy. She is also indebted to Andy Adamson for the knowledge gained from working with him and his team at Cool Pilates. In addition to teaching Pilates for improved conditioning, strength and overall wellness to her regular client base, Rachel specialises in the rehabilitation and strengthening of professional ballet dancers and pre-professional ballet students. Starting in 2015, she helped prepare a British/European Sprint Champion for his participation in the 2016 Rio Olympic Games and continues to help him and a team of ten other elite sprinters with fine tuning and conditioning. Rachel has an MA from the University of Birmingham based on research into Osteoporosis and other health related issues in female ballet dancers and athletes. She has also been a key speaker at the Dance UK Royal Society of Medicine conference and Birmingham University’s Symposium on the Psychology of Dance, where she shared her knowledge and experience on the Female Athlete Triad and Osteoporosis. Steff’s first “Pilates’ class was actually a lovely stretch class, but, as she was recovering from a disc prolapse with severe sciatica, it was enough to introduce her to an alternative, more mindful way of moving. It would be four years, two pregnancies and another disc prolapse (this time with foot drop caused by damage to the nerves) before she discovered Pilates apparatus existed. Since then Pilates has helped her to overcome debilitating back pain and, in 2014/15, to get through treatment for breast cancer. Steff has always lead an active lifestyle which resulted in her teaching PE in a large secondary school in Solihull for eight years, where she became Head of Department. She played hockey and rugby for local teams, training three times a week, and helped with some rugby coaching for girls. She represented the Midlands area in rugby and is proud to say she played against two England captains. 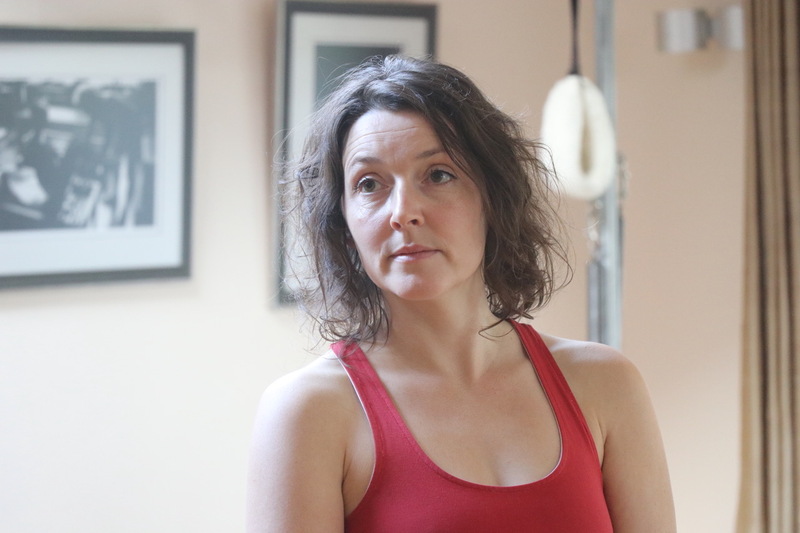 She completed a year long, full time apprenticeship training with Andy Adamson at Cool Pilates (accredited through OCN and the Oxford School of Pilates, overseen by Jane Paterson) which gave her thorough grounding and initial certification in mat and apparatus teaching: she has been teaching Pilates since 2007. Since then she have been inspired to teach a more classical style of Pilates, attending workshops with a variety of internationally renowned teachers, including Kathi Ross-Nash, Karen Frischmann, Andrea Maida, Amy Kellow, Jean Claude Nelson, Brooke Siler, and Kirk Smith, with whom she is studying currently. She is also certified to teach people with Neurological Conditions, specifically Multiple Sclerosis and Parkinson’s, through workshops with Mariska Breland. Regaining her physical confidence has allowed her to try new activities: ballroom dancing, horse riding, and a return to skiing. When her daughter wanted to learn a martial art, she learned Taekwondo with her, and gained her 1st Dan black belt in 2017. Later that year she had the opportunity to join Cirquestars, learning a variety of circus aerial and ground based skills, and she was thrilled to perform in two shows alongside her daughters. She is passionate about helping people to discover the benefits of Pilates – to become more body aware, to be proactive in improving how well they move and to lead a fuller life: she loves to help clients progress, and to feel empowered. She enjoys the variety and challenges teaching brings, including: clients suffering from neurological conditions; back/neck/shoulder/hip issues; breast cancer; pre/post-natal women; athletes from Birchfield Harriers; aerialists from CircusMash and the Birmingham Youth Circus. Darren began his Pilates journey in 2013 whilst training to be a Personal Trainer. The teacher suggested that he try Pilates so he started taking a mat class at a local studio. This inspired him to enrol in a Pilates mat course with Body Control Pilates and after numerous hours of practise and supervised teaching became a qualified teacher. He then embarked on a year-long apprenticeship with Andy Adamson at Cool Pilates, where he first discovered the Classical Pilates method, learning Pilates as a system of exercises using all the studio apparatus, not just mat work. After this he completed a comprehensive training program with world renowned Pilates teacher Kirk Smith at the Classical Pilates Centre in Bollington, deepening his knowledge of the Pilates system. Classical Pilates has completely changed his body, improved his posture and successfully rehabilitated a shoulder injury. He sees massive changes in his clients from following the method and sees them getting stronger, more flexible and taller! He has experience of working with a range of different clients from athletes, dancers, people with back pain and more recently he is teaching a number of clients with Ehlers-Danlos syndromes. He will always be a student of Pilates, attending courses to update his practice, studying with different teachers and learning the most from his clients. Her first experience of Pilates was with Paul McLinden at Brighton University whist studying for a Dance and Arts Degree. The experience was profound and she continued to take Paul’s classes at the University and around Brighton whist studying ballet, contemporary dance, contact improvisation and yoga. She went on to study dance at Trinity Laban, London, where she experienced her first Pilates studio and the benefits of working on the apparatus. The teachers there were Jessica Moolenaar and Peter Curtiss who introduced her to the rehabilitation side of Pilates after she suffered a severe hip injury from dancing. She went on to become a Personal Trainer and gained a Pilates qualification. She started teaching in health clubs and country clubs, and, whilst enjoying it immensely, began to realise the need for attention to detail that can’t be given teaching a class of 30 participants. She then went on to teach in a Pilates studio and became apprentice to Peta Davis where she learned about apparatus work and taught Matwork to small groups. With Polestar Pilates she continued her studies into rehabilitation in the Pilates environment. She took a break from Pilates but returned with new enthusiasm after having a baby left her with severe Symphysis Pubis Dysfunction which saw her unable to walk properly. At the same time her father was suffering from an aggressive form of Parkinson’s that was extremely debilitating. 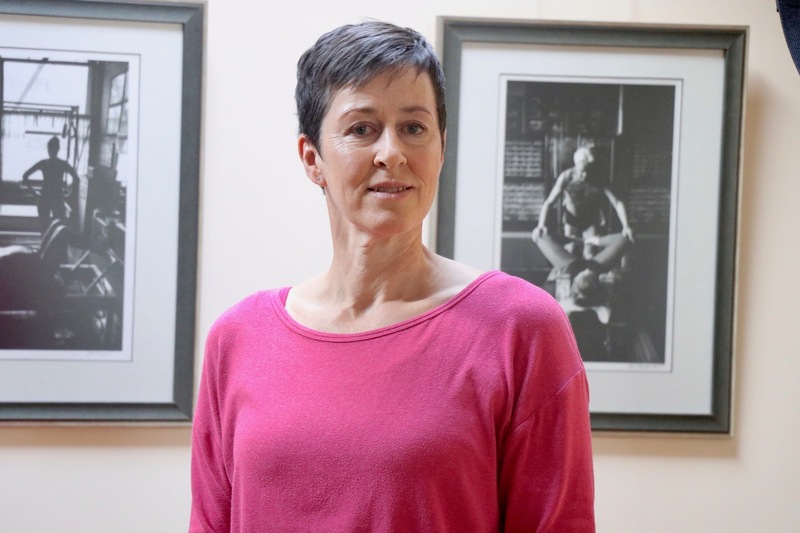 Both experiences directed her towards the rehabilitation side of Pilates so she become a student of the renowned Alan Herdman whose work centres around rehabilitation. Alan gave her a fresh view of Pilates which lead her to change her teaching approach. She started taking class with Andy Adamson in 2017 at Cool Pilates; during 2018 she become his apprentice training in Classical Pilates. This time with Andy has been, and continues to be, truly inspirational as she deepens her knowledge and explores the origins of the work further. It has brought together again her love of Pilates and her love of dance. When Angela and Andy shared their practises they instantly saw synergy between what Andy’s goals were for himself and his clients and how Anatomy Trains Structural Integration (ATSI) could contribute. ATSI is a brand of Structural Integration, a hands-on therapy, developed by Tom Myers, author of Anatomy Trains. Fluidity, balance and strength in the human body require length and balance of the soft tissues. The Cool Pilates team have a wonderful knowledge of how to achieve this. Angela’s role is to assist when a client is unable to achieve this through Pilates alone. Our bodies have a wonderful ability to keep us functioning. They continue to do so despite having “silent” areas that have lost movement. Everything in our structure has a rhythm and should be fluid. When we lose fluidity, layers of tissue become sticky and eventually stuck. These stuck areas limit our movement so our body naturally compensates. These compensations begin from our feet zig zagging their way up to our heads. They also exist from superficial fascia on the surface to deep inside. This is when we begin to experience aches, pains and reduced movement. Angela owner of Structural Balance has developed a unique way of working that combines ATSI techniques with Active Fascial Release. She uses a structured approach over a number of sessions to bring a body back into its natural alignment, length and balance “making posture and movement easier”. Sessions with her last 1 hour 30mins and clients will receive work both on and off the treatment couch in movement, always looking to refine balance and length which for most clients accelerates their Pilates goals. Structural Integration has a number of Schools of Training which all originate from the founder Dr Ida Rolf. Practitioners carry different branding depending on where they trained, Rolfer, Hellerworker, Soma Practitioner, ATSI, etc. Angela has trained with Anatomy Trains and qualified as an ATSI Practitioner in 2012. Her continuing education can be viewed here.